Symbol for Swale main channel (without an underdrain) used in the MIDS calculator. For a swale main channel BMP (no underdrain), stormwater can be retained through three separate methods. Stormwater can infiltrate into the soils as it travels through the main channel to the outflow, stormwater can pond behind a check dam and infiltrate into the underlying soils, or stormwater can be stored in the pore spaces of an engineered bioretention base and infiltrate into the underlying soils. If stormwater runoff to the main channel flows over a side slope through sheet flow, then a swale side slope BMP should be used in combination with the swale main channel BMP in the MIDS calculator. All pollutants in the infiltrated water are credited as being reduced. A portion of pollutants in the stormwater that flows through the channel outflow is removed through filtration and sediment removal. Screen shot of Watershed tab for Swale main channel. The user must input a value for impervious area or the BMP will not provide volume and pollutant reduction. Other fields are optional. Screen shot of BMP parameters tab for Swale main channel. The user must enter values for all blank cells. 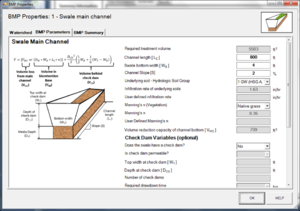 For swale main channel systems, the user must input the following parameters to calculate the volume and pollutant load reductions associated with the BMP. Routing/downstream BMP: if this BMP is part of a treatment train and water is being routed from this BMP to another BMP, the user selects the name of the BMP to which water is being routed from the dropdown box. All water must be routed to a single downstream BMP. Note that the BMP receiving the routed water must be included by the user in the Schematic tab or the BMP will not appear in the dropdown box. If a swale side slope is routed to this BMP, do not include the side slope watershed areas for the swale main channel since this would effectively double-count the side slope contributing area. Underlying soil - Hydrologic Soil Group: The user selects the most restrictive soil (lowest hydraulic conductivity) within 5 feet of the soil surface or the soil/media interface (if a bioretention base is utilized) of the swale main channel. There are 14 soil options that fall into 4 different Hydrologic Soil Groups (Hydrologic Soil Group (HSG) A, B, C, or D) for the user. Once a soil type is selected, the corresponding infiltration rate will populate the “Infiltration rate of underlying soils” field. The user may also select “User Defined.” This selection will activate the “User Defined Infiltration Rate” cell, allowing the user to enter a different value from the value in the predefined selection list. The maximum allowable infiltration rate is 1.63 inches per hour. Manning’s n (Vegetation): The user selects a type of vegetation cover on the swale main channel, which populates a corresponding Manning’s n. The vegetation types are mowed turf or native grasses. Mowed turf would be selected if the main channel is mowed on a consistent basis. Native grasses would be selected if the main channel is left to grow or is mowed infrequently. Once a vegetation cover is selected, the corresponding Manning’s n will populate in the “Manning’s n” field. The user may also select “User Defined.” This selection will activate the “User Defined Manning’s n” cell, allowing the user to enter a value different from the values in the predefined selection list. Does the swale have a check dam? : This is a YES/NO question. The user selects YES if one or more check dams have been installed in the swale main channel. By selecting YES, the “Is check dam permeable?” input box will become active. Is check dam permeable? : This is a YES/NO questions. The user selects YES if the check dams are permeable, allowing stormwater to filter through the media and NO if they are impermeable, acting as a dam and providing extended detention in the swale main channel. If NO is selected, the design parameters associated with the check dam will become active. If YES is selected, the design parameters will remain inactive as no credit toward the performance goal is obtained for permeable check dams. Top width at check dam (WT): This is the width of the check dam at the overflow elevation (top of check dam) and is used to calculate the storage volume behind the check dam. Units are in feet. Depth at check dam (DCD): This parameter represents the elevation change between the overflow point of the check dam (top of check dam) and the soil surface of the swale. Units are in feet. Number of check dams: This parameter is the number of check dams built throughout the length of the swale main channel. If multiple check dams are constructed, enter the average value of all dams for top width and depth. Required drawdown time: This is the time in which the stormwater captured and ponded behind the check dam must drain into the underlying soil/media. The user may select from predefined values of 48 or 24 hours. The MPCA Construction Stormwater General Permit requires drawdown within 48 hours, but 24 hours is Highly Recommended when discharges are to a trout stream. The calculator uses the underlying soil infiltration rate and the “Depth at check dam” to check if the BMP is meeting the drawdown time requirement. The user will encounter an error and be required to enter a new “Depth at check dam” if the stormwater stored in the BMP cannot drawdown in the required time. Does the swale have a bioretention base? : This is a YES/NO question. Answer YES if the swale main channel has engineered soils similar to a bioretention basin. Answer NO if the swale main channel has native soils rather than engineered media. If YES is selected, then the design parameters associated with the bioretention base will be activated. Media depth (DM): This is the depth of the bioretention base media installed from the surface of the swale main channel down to the native soils. Units are in feet. Media porosity minus field capacity (n - FC): This is the ratio of media pore space to the total media volume in the bioretention base media installed from the surface of the swale main channel down to the native soils. If multiple types of media are used in the BMP, this value should be a weighted average of the soil water storage values of the media installed from the surface of the swale main channel down to the native soils. Values for porosity and field capacity based on soil type can be found here. The user inputs this value in cubic feet of pore space per cubic feet of media. The recommended range for this value is 0.15 to 0.35. 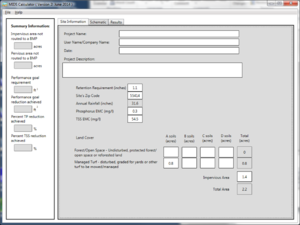 If the DDTcalc is greater than the user-specified required drawdown time then the user will be prompted to enter a new check dam depth or infiltration rate of the native soils. The swale main channel BMP without an underdrain can achieve volume reduction capacity through three mechanisms. The first is from infiltration as the stormwater travels along the main channel (VMC). The second is from infiltration of stormwater that is stored behind an impermeable check dam (if installed) (VCD). The third is from infiltration of stormwater that is stored in the media of the bioretention base (if installed) (VBB). The total instantaneous Volume reduction capacity of BMP [V] due to these three mechanisms is calculated using BMP design inputs provided by the user. This Volume reduction capacity of BMP [V] is then compared to the Required treatment volume in order to determine the Volume of retention provided by BMP, which is the instantaneous volume credit that can be claimed for that BMP. With no real storage capacity unless impermeable check dams are present, the main method of stormwater volume reduction in a swale with no underdrain is via infiltration as the stormwater travels through the main channel. The infiltration capacity of the swale main channel bottom (VMC) is estimated based on analysis of long-term modeling results as described in the following paragraphs. To determine the average annual volume reduction credit given for a swale main channel, the P8 water quality model was used. Fifty-five (55) years of hourly rainfall data were modeled for swale main channels with various configurations of channel length, swale bottom width, channel slope, soil infiltration rate, and Manning’s n parameters. The model results provided annual average volume reduction rates. Multivariate regression was used to assess model results to determine the relationships between swale modeling parameters and annual volume reductions. The observed relationships are paired with the user-provided inputs to calculate an annual percent stormwater volume reduction for the swale main channel in the calculator. To obtain the volume reduction capacity of the channel bottom (VMC), the annual volume reductions are converted to a volume reduction capacity. This is accomplished through the use of performance curves developed from a range of modeling scenarios. The performance curves use the annual volume reduction percentage, the infiltration rate of the underlying soils, the contributing watershed percent impervious area, and the size of the contributing watershed to calculate the volume reduction capacity achieved through infiltration along the swale main channel (VMC). WT is the top width of the check dam in feet. The volume reduction capacity of the check dams (VCD) is added to the volume reduction capacity achieved through infiltration along the swale main channel (VMC). 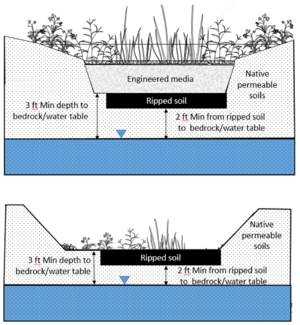 If a bioretention base is selected, then the credit given for the infiltration into the soils of the main channel (VMC) is removed since all stormwater that would have infiltrated into the soils as it travels through the main channel is now instead collected in the pore space of the media. If check dams are installed the total stormwater volume reduction capacity of the swale main channel would be equal to the volume reduction provided by the bioretention base (VBB) plus the storage capacity of the check dams (VCD). The MIDS calculator compares the Volume reduction capacity of BMP [V] with the Required treatment volume, and the lesser of the two values is used to populate the Volume of retention provided by BMP. This comparison between potential and actual treatment volumes ensures that the BMP does not claim more credit than is due based on the actual amount of water routed to it. The Volume of retention provided by BMP is the actual volume credit the BMP receives toward the instantaneous performance goal. For example, if the BMP is oversized the user will only receive volume credit for the Required treatment volume routed to the BMP. Annual volume retention is assessed by converting the instantaneous Volume reduction capacity of BMP [V] to an annual volume reduction percentage. This is accomplished through the use of performance curves developed from a range of modeling scenarios. These performance curves use the Volume reduction capacity of BMP [V], the infiltration rate of the underlying soils, the percent imperviousness of the contributing watershed area, and the size of the contributing watershed to calculate the Percent annual runoff volume retained and annual Retention volume provided by BMP. 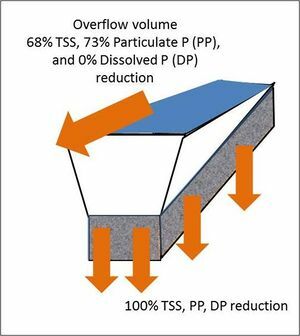 Schematic showing the mechanism for pollutant load reductions for infiltrated and overflow water. Pollutant removal can be accomplished both via volume reducing and non-volume reducing processes in this BMP. Pollutant load reductions are calculated on an annual basis and are thus dependent upon the volume of water retained by the BMP through infiltration and the volume of water treated by filtration and sediment removal in the BMP. The previously discussed annual volume reduction percentages are used to determine the annual pollutant load reductions achieved by the BMP. All pollutants in the infiltrated water are considered captured for a 100 percent removal. While oversizing a BMP above the Required treatment volume will not provide additional credit towards the performance goal volume, it may provide additional pollutant reduction. For water routed to the main channel that does not infiltrate, pollutant removal occurs through filtration and sediment removal. Removal rates for this water are 68 percent for total suspended solids (TSS), 73 percent for particulate phosphorus, and 0 percent for dissolved phosphorus. Overflow from a swale main channel can be routed to any other BMP, except for a green roof, a swale side slope, or any BMP in a stormwater treatment sequence that would cause stormwater to be rerouted back to the swale main channel already in that sequence. All BMPs can be routed to the swale main channel. The following general assumption applies in calculating the credit for a swale main channel. If this assumption is not followed, the stormwater volume and pollutant reduction credits cannot be applied. The swale main channel has been properly designed, constructed, and will be properly maintained according to specifications for filtration systems. Schematic used to determine the watershed characteristics of your entire site. In this example, runoff from a 1.4 acre impervious lot enters a swale side slope and then the swale main channel. Pervious acres include the turf area and the swale (side slope and main channel). See Step 1. Screen shot of the Site Information tab of the MIDS calculator. See Step 2. Screen shot of Schematic tab for MIDS calculator. 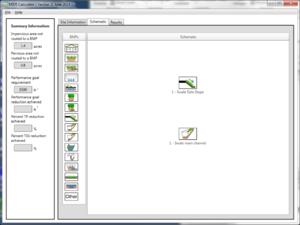 Drag and drop a Swale Side Slope and a Swale Main Channel icon into the Schematic Window. See Step 3. 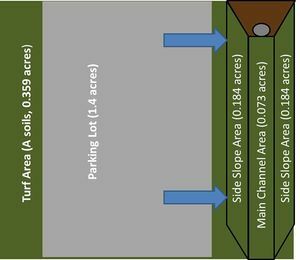 The runoff from a 1.4 acre parking lot surrounded by 0.359 acres of pervious turf area flows through sheet flow over one of the side slopes of a swale and into a swale main channel. The soils across the area have a unified soils classification classification of SW (HSG type A soil). A second side slope associated with the main channel does not receive runoff from impervious surfaces. Each of the swale side slopes are 800 feet long by 10 feet wide with a side slope of 5H:1V. The main channel of the swale is 800 feet long by 4 feet wide with a 2 percent slope. The swale main channel does not have an underdrain, bioretention base or check dams. The maintenance on the swale calls for mowing once a year. The following steps detail how this system would be set up in the MIDS calculator. Step 1: Determine the watershed characteristics of your entire site. For this example we have a 2.2 acre site with 1.4 acres of impervious area (parking lot) and 0.8 acres of pervious area in type A soils. The pervious area includes the turf area and the area of the swale side slopes and main channel. Step 2: Fill in the site specific information into the Site Information tab. This includes entering a ZIP Code (55414 for this example) and the watershed information from Step 1. The Managed Turf area includes the turf area, the area of the side slopes and the area of the main channel. ZIP code and impervious area must be filled in or an error message will be generated. Other fields on this screen are optional. Step 3: Go to the Schematic tab and drag and drop a Swale Side Slope and a Swale Main Channel icon into the Schematic Window. Step 4: Determine the watershed characteristics for each of the BMP components. For this example the swale side slope watershed includes 1.4 acres of impervious area and 0.543 acre of pervious area (0.359 acre of turf area plus 0.184 acre of swale side slope). The watershed of the swale main channel includes the pervious area of the main channel (0.073 acre) and the pervious area of the other swale side slope (0.184 acre) for a total pervious area of 0.257 acre. Since no impervious area is being routed to the second swale side slope, the area can be included in the direct watershed area of the main channel. However, the second swale side slope could be placed in the calculator as an additional BMP. Including it as a separate BMP provides a slightly greater annual volume reduction and more closely represents the true system. Step 5: Open the BMP properties for the swale side slope by right clicking on the Swale Side Slope icon and selecting Edit BMP Properties, or by double clicking on the Swale Side Slope icon. Step 6: If help is needed, click on the Minnesota Stormwater Manual Wiki link or the Help button to review input parameter specifications and calculations specific to the Swale Side Slope BMP. Step 7: Fill in the specific BMP watershed information (1.4 acres of impervious and 0.543 acre of Managed Turf on A Soils). Route the side slope BMP to the main channel BMP. MIDS calculator screen shots for inputs for swale side slope and wet swale. Click on an image for enlarged view. Screen shot of Watershed tab for swale side slope. See Step 4. Screen shot of BMP Parameters tab for swale side slope. See Steps 5 through 8. Screen shot of Watershed tab for swale main channel. See Step 13. 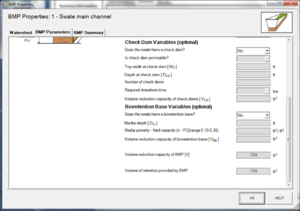 Screen shot of BMP Parameters tab for swale main channel. See Step 14. MIDS calculator screen shots of results and summary tabs. Click on an image for enlarged view. Screen shot of BMP Summary tab for swale side slope. See Step 9. Screen shot of BMP Summary tab for wet swale. See Step 15. Screen shot of Results tab for the entire site. See Step 17. Step 9: Click on BMP Summary tab to view results for this BMP. Step 10: Click on the OK button to exit the BMP properties screen. An arrow will appear showing that the swale side slope has been routed to the swale main channel. Step 11: Open the BMP properties window for the swale main channel by right clicking on the Swale main channel icon and selecting Edit BMP properties, or by double clicking on the “Swale main channel” icon. Step 12: If help is needed, click on the Minnesota Stormwater Manual Wiki link or the Help button to review input parameter specifications and calculation specific to the Swale main channel BMP. Step 13: Enter in the watershed information for the swale main channel in the Watershed tab (0.257 acre for Pervious Turf on A Soil, which includes the area of the main channel and the other side slope). Step 15: Click on BMP Summary tab to view results for this BMP. Step 16: Click on the OK button to exit the BMP Properties screen. Step 17: Click on Results tab to see overall results for the site.